WASHINGTON — While you were home for the holidays, a phenomenal movie made its limited release on Christmas Day and instantly made our Top 3 Movies of 2014. This weekend, “Selma” can finally be seen at dozens of movie theaters across the D.C. area, as the film at long last makes its nationwide release. Set in 1965, the movie chronicles Dr. Martin Luther King Jr. (David Oyelowo) in his struggle for equal voting rights for African-Americans by staging an epic march from Selma to Montgomery, Alabama. Lesser filmmakers would have given into the temptation of trying to cram too much into the story, jumping around in time to include King’s “I Have a Dream” speech of 1963, the passage of the Civil Rights Act of 1964 and King’s assassination in Memphis in 1968. But director Ava DuVernay and screenwriter Paul Webb remain disciplined in their approach, diving into a very specific slice of history: the events that led up to the Voting Rights Act of 1965. This was a key moment in the struggle for civil rights; while President Lincoln had abolished slavery with the 13th Amendment and President Lyndon B. Johnson had outlawed discrimination in 1964, many states still had disturbingly creative ways of blocking African-Americans from the ballot box. A series of Jim Crow measures made a giant section of Americans outsiders to their own democracy. As for the players who passed that bill, the film’s characterizations have stirred controversy. Some have criticized the portrayal of LBJ as a reluctant participant. Others have defended it as accurate. Either way, the film deserves credit for its balanced portrait of the central figure, King, who’s depicted warts and all. He is not anointed an infallible saint — quite the contrary. DuVernay shows King as a human being, grieving the deaths of his followers and confronted by wife Coretta Scott King about his rumored adultery exposed by J. Edgar Hoover’s FBI wiretaps. These wiretaps hang over the entire film, appearing routinely as teletype subtitles stamped with the seal of government approval. It’s just one of DuVernay’s clever directorial touches in a filmmaking style that can only be described as graceful, from slow-motion violence depicting a bomb blast, to a crane shot swooping down from the Edmund Pettus Bridge. Like Hitchcock before her, DuVernay understands that the high angle can denote a turning point in the story. She doesn’t use it during “Bloody Sunday” on the bridge; instead, it comes at a moment of change. DuVernay deserves to become the first African-American woman to earn an Oscar nomination. Of course, I’d much rather live in a time when such firsts are no longer news, but we’re not there yet. Hallelujah for the day when these firsts are old news and true equality is achieved. Speaking of firsts, “Selma” marks the first Golden Globe nomination for Oyelowo, who makes us forget we’re watching an actor and makes us believe we’re watching King in the flesh. You’ll remember him as Forest Whitaker’s rebellious son in Lee Daniels’ “The Butler” (2013) and a dutiful astronaut in Christopher Nolan’s “Interstellar” (2014). If Matthew McConaughey was right, that we look up and wonder about our place in the stars, Oyelowo is a rising star in the Hollywood galaxy. His performance is backed by a stellar supporting cast, including Carmen Ojogo as Coretta Scott King, Oprah Winfrey as Annie Lee Cooper, Wendell Pierce as Reverend Hosea Williams, Stephan James as John Lewis, Nigel Thatch as Malcolm X, Tom Wilkinson as LBJ, Tim Roth as Alabama Governor George Wallace and rapper Common (who also collaborates with John Legend for the Golden Globe-nominated song “Glory”) as James Bevel. Even the smaller moments feel authentic, namely a scene where 82-year-old Cager Lee (Henry G. Sanders) mourns the loss of his son, Jimmie Lee Jackson (Keith Stanfield), an unarmed black man who became a civil rights martyr after being shot and killed by an Alabama state trooper. The timeliness of such themes can’t be overstated. When DuVernay set out to make “Selma,” she knew the stories of Trayvon Martin and Oscar Grant, but she had no idea that 2014 would add the names Michael Brown and Eric Garner to America’s long, complicated history of racial conflict. The retaliatory murders of Brooklyn police officers Wenjian Liu and Rafael Ramos were just as disturbing. And so, the message of “Selma” — racial equality achieved by peaceful protest — speaks not only to protestors shouting “Hands up, don’t shoot,” but also to those who feel outraged by the fiery riots and looting in Ferguson, Missouri. The film stakes its claim not to militant rebels, but to the high road traveled by Jesus, Gandhi and King, praising history’s peaceful martyrs and asking why mankind continues to strike down our most loving agents of change with assassins’ bullets. “Selma” follows in the footsteps of “12 Years a Slave” (2013) winning Best Picture. Seeing as a heavy drama on race relations dominated the awards last year, voters might shift their attention to a different theme this year. When “In the Heat of the Night” won Best Picture in 1967, Oscar next swung to a musical in “Oliver!” (1968). When “Driving Miss Daisy” won in 1989, Oscar next swung to a western in “Dances with Wolves” (1990). And when “Crash” won in 2005, Oscar next swung to a gangster flick in “The Departed” (2006). “Selma” faces tough competition. There’s simply a great crop of films this year. Any other year, “Selma” would be the cream of the crop. 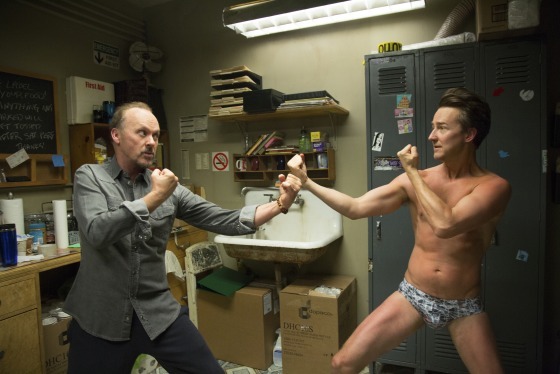 It just so happens that this year it’s competing against “Boyhood” and “Birdman,” two of the most amazing movies to hit the movie screen this century. A bronze medal for “Selma” against this type of competition is not too shabby at all. 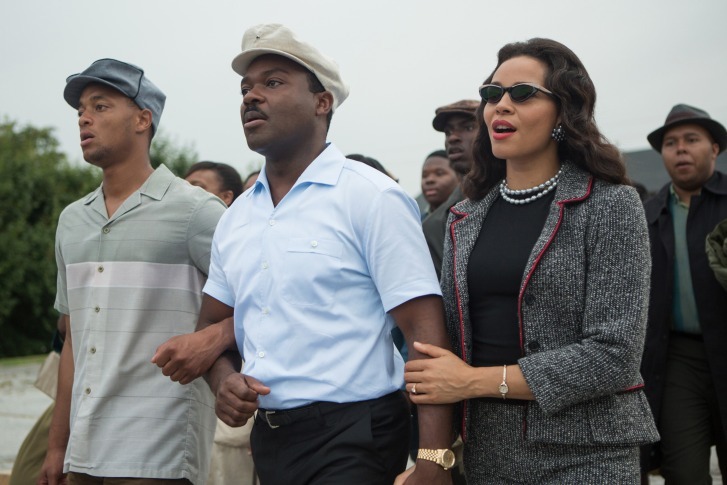 “Selma” is working with a head-scratching award-season strategy. First, the film had a later release date than most, arriving in January like “Zero Dark Thirty,” which fell to “Argo.” It has also suffered issues in the sending of DVD screeners to award voters. While Paramount sent screeners to Academy voters in December, it chose not to do so for the guilds, causing the film to be shut out by the Screen Actors Guild and Producers Guild of America. You can’t vote on what you can’t see. Regardless of the politics of the award season, “Selma” is a must-see movie for anyone who loves history, human emotion and first-rate storytelling. It combines the best elements of the year’s best movies — the struggle for human rights in “The Imitation Game,” the soul-searching infidelity of “Wild,” the enduring marital bonds of “The Theory of Everything,” the power of media portrayals in “Gone Girl” and “Nightcrawler,” the haunting wiretaps of the Edward Snowden documentary “Citizenfour,” even the deadly 1963 church bombing in Birmingham, which a 21-year-old Roger Ebert covered for his school newspaper, as detailed in Steve James’ documentary “Life Itself” (2014). “Selma” is the culmination of our cultural conscience as it stands in 2015. It teaches us that looking backward is often the best way forward. It knows that the fierce urgency of now is nothing without the learned lessons of the past. And it warns that history is doomed to repeat itself unless brave souls step forward with the courage of conviction and the humility of peaceful protest. The above rating is based on a 4-star scale. See where this film ranks in Jason’s Fraley Film Guide. Follow WTOP Film Critic Jason Fraley on Twitter @JFrayWTOP. Follow @WTOP and WTOP Entertainment on Twitter and WTOP on Facebook.